The 70’s and 80’s produced many beautiful homes. They have attractive features such as Victorian detailing, two-story brick, massive chimneys, natural wood or stone siding, hardwood floors and many other outstanding features. When purchasing one of these older homes it is important to realize that the materials used in the plumbing and electricity do not meet the standards we enjoy today. This makes it important to have a thorough inspection done or prepare to have some major replacements. As a guide, check out our previous post 5 Plumbing Tips Before Buying an Old Home. Early water systems typically used galvanized pipes while sewers were constructed of cast iron, transite, Orangeburg (a product made of tarpaper) or clay. 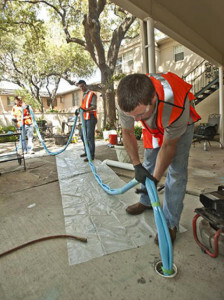 Overtime, many of the water pipes can become corroded, develop leaks and have other problems. In a sewer line, rust and roots are common problems that cause the pipe to break. Older pipes such as these cannot be fixed by traditional plumbing repair. Fortunately, today’s plumber can often do water system re-piping or replace sewer lines with a minimum of damage to the surrounding areas. Contacting a good plumbing company with an established reputation for good work is the first step in learning what can be done in your particular situation. They fully understand the water system problems of older homes and can advise you as to what is needed to have your pipe infrastructure put in good working order. While regular water line or sewer pipe repair is traditional, the trenchless method is an excellent way to replace damaged water or sewer lines. Sometimes the plumber will combine both methods to obtain the best results and save on your costs. A customary water line excavation requires exposing the water lines, making the repairs and backfilling the trench. A good plumbing company will carefully remove the excess dirt and leave the property in its original state. However, water line replacement can also involve interior areas. This means re-routing water lines through walls and attics and involves repairing walls and other areas that are damaged by the replacement. Any lead pipes (used in the early 1900s)can leach into your drinking water and should be removed at once. It can cause a serious health problem. Polybutylene pipes (used 1970-1990) are extremely brittle and will break easily. 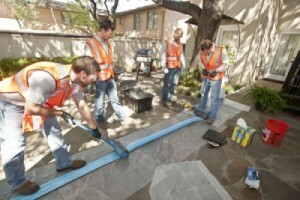 New methods of sewer line repairs make it possible to repair or replace sewer lines without damaging patios, driveways or other construction on the property. It is called trenchless sewer line repair. The first thing a plumber will do is put a camera down the line to see what is causing the damage. This may be root damage, rust erosion or other problems that have caused the pipe to quit providing proper drainage. Once the damage is determined, repair can be made without disturbing the above area. One of the most popular is the CIPP (cured in place) method. This is done by using air to push a seamless epoxy pipe lining in the old sewer line. Once in place, warm air will be used to seal the lining into place. Another trenchless sewer line replacement is done by digging a hole at each end of the sewer line. Specialized equipment is used to drag a new pipe through the old one. This method is called pipe bursting. Commercial and residential plumbing services require a company that is well known for its plumbing expertise. Look for a company that provides high quality service at reasonable prices. If you have a plumbing problem call us at Accurate Leak and Line for more information regarding plumbing options.